I walk through Vans. The doors are rolled up and open. Sunlight streams through the windows and openings. Very few people are here. An air of expectancy still lingers… The Combi pool waits. It is gray and cavernous. It is cold and it is patient. A giant yawning hole in the floor that stretches out. Contours. Round and inviting. I slide down across its face and walk around. My footsteps echo and I ponder over all that have been here before me. I was here in November of 1998 when it opened. 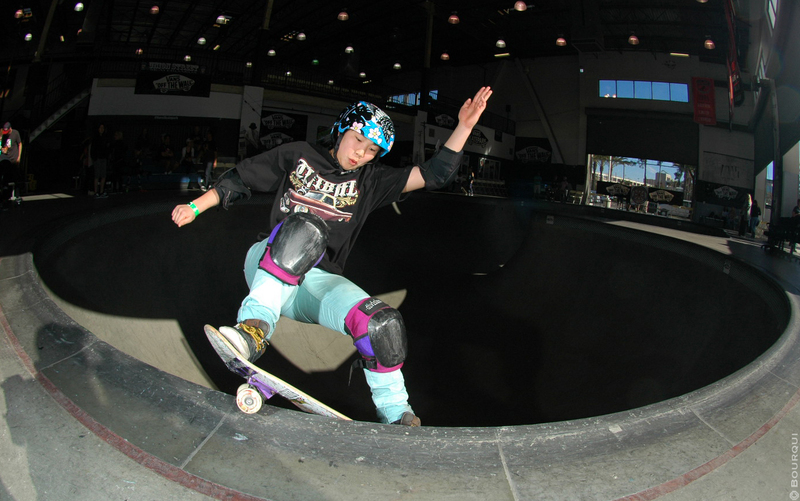 The youngest skater on the deck was over thirty years old. The only time we ever saw a young grom in the bowl was when we’d kick them out for using it as a sliding board. We never saw a girl skater back then… Everything is different now. I look up as Mario of Vans and the crew get to work on last minute details. PA system. Banners. Mopping. Chair setup. The building comes to life. I look up at the red and black banners above the pool. Victory streamers. Cara Beth Burnside. Mimi Knoop. Julz Lynn. Past winners. Personal sacrifices and personal victories. 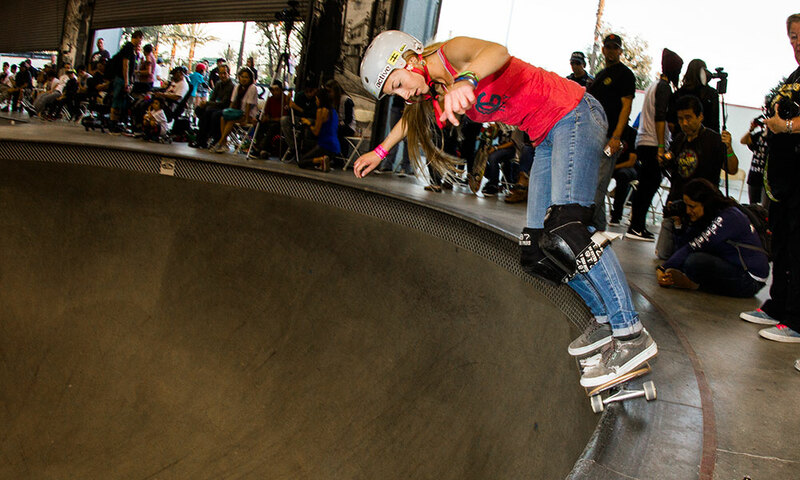 The ladies are no longer that much different than the men as far as skateboarding is concerned. They charge. They progress. They feel pain and they most definitely break. I watched them break physically and mentally at the US Open last year. I saw Justyce Tabor ripping with style and power, only to slam and fracture her arm. Defeated… but not for long. Mimi, Allysha, Lizzie, CB- injured all. Resolved to return to the very thing that makes and breaks us. The common thread. Male or female. It is all the same. Skateboarding. Who can escape what they desire? There can be no other way. 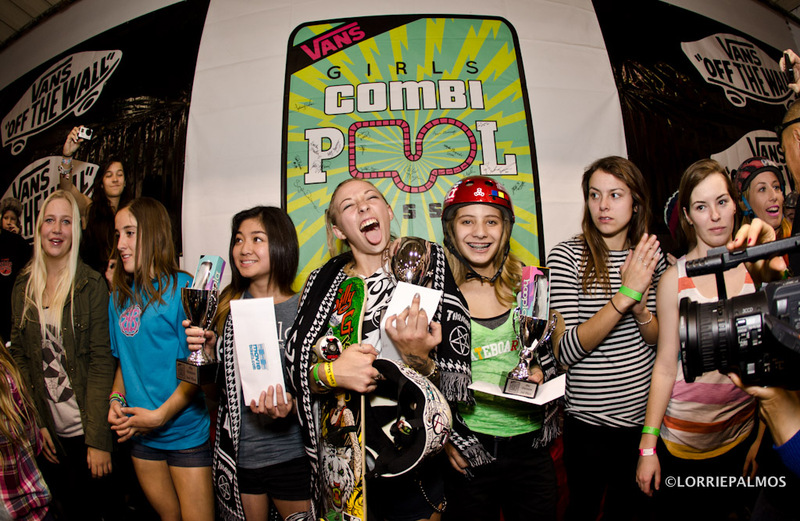 Last year, Nora Vasconcellos came on like a hurricane and took the top spot. Speed, power and style paved the way for her podium portrait. What would happen today, I wondered. I watched Don and Danielle Bostick preparing the judges sheets and separating things into heats. There were up to three heats of riders in each division. It was going to be a real toss up on how the event unfolded. 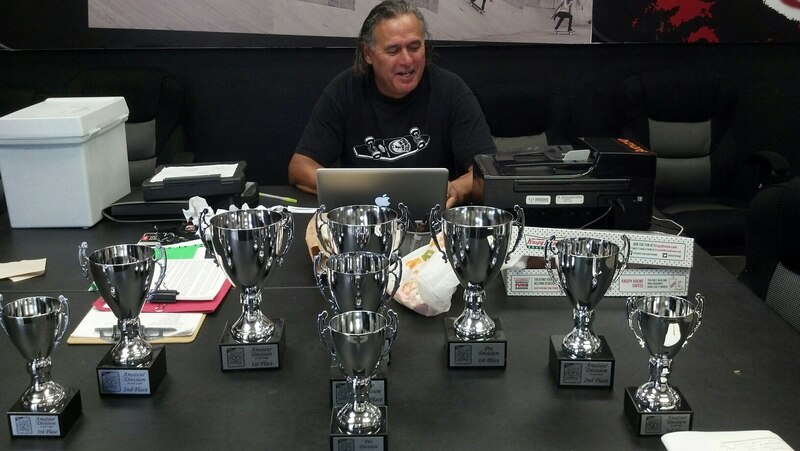 I spoke with judge Steve Caballero. 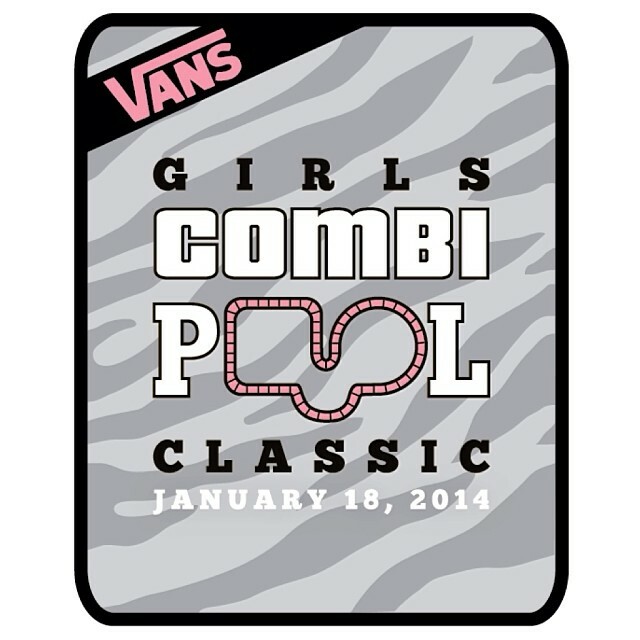 He told me, “In the Combi contest, I look for consistent use of the entire pool. 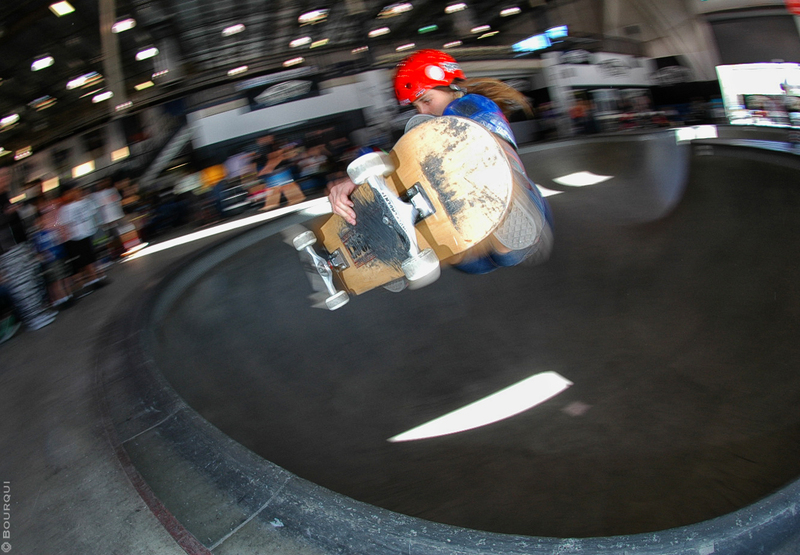 A skater should use both round and square. I judge on technicality, style, consistency and creativity. 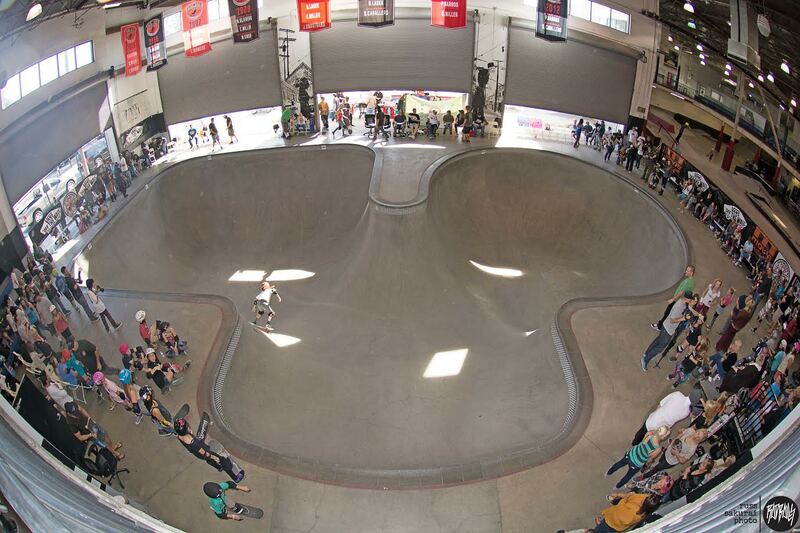 Each element is so important.” The building filled up with skaters, parents and onlookers. The Clash rumbled through the building by a solid DJ on the deck. 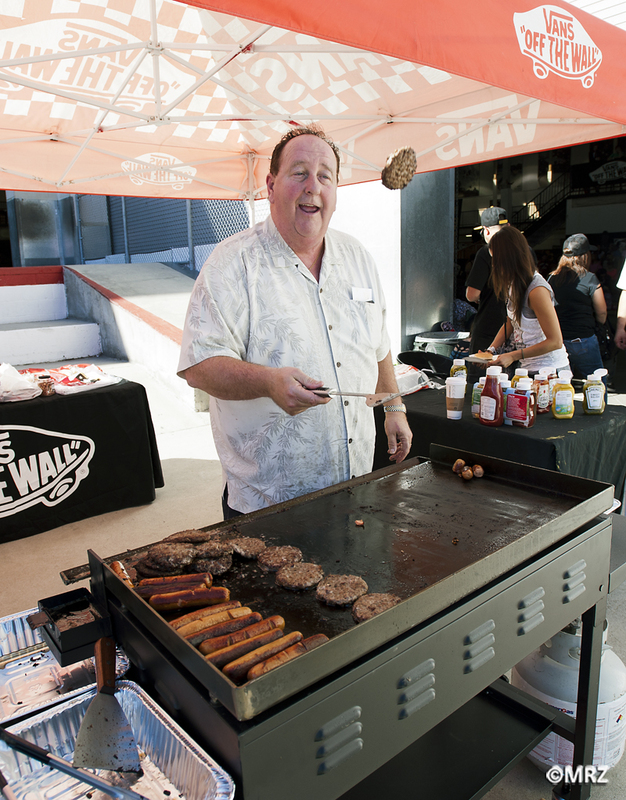 Steve Van Doren started cooking Vans sandwiches, a last minute judges meeting was held by Dave Duncan and off we went. The fourteen and under division started rolling. There was a visible increase in technicality and power this year. The riders were using more of the pool and going higher. In the past, it seemed as though the Combi swallowed this division up. 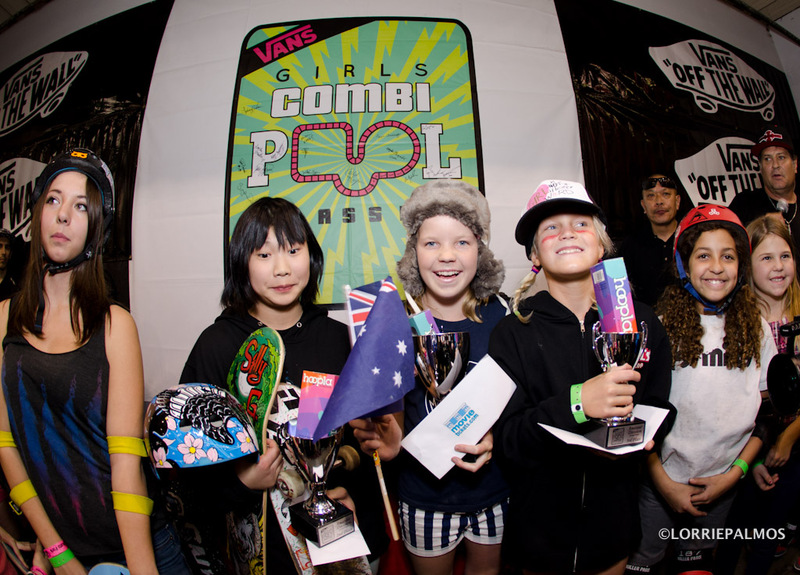 Not so on this day… In the end, It was Poppy Starr in first, Kisa Nakamura (flew in from Japan) in second, Bryce Wettstein in third place and Pauline Branom in fourth place. The fifteen and older division girls rolled into the bowl next and whatever they wanted to do, they did. Big airs, fast grinds, ollies, rock slides and speed were evident everywhere. These girls showed a dramatic improvement over last year and it was great to witness their use of the bowl hips and corners in this division. In the end, the judges whittled it down. 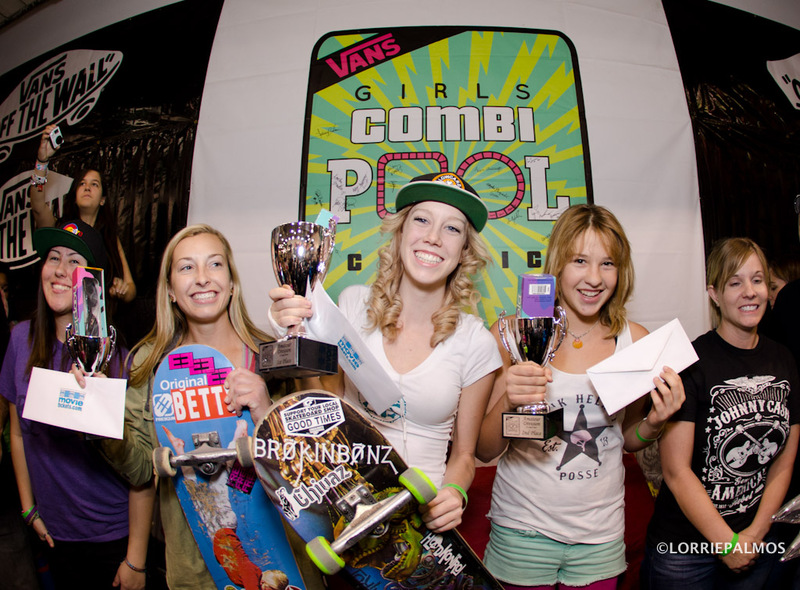 Beverly Flood in first place, Jordyn Barratt in second place and Brittney Conrad in third place. The Pro division was next and — make no mistake — it was going to be intense. Practice was interesting. Julz Lynn was skating a bit more recklessly than usual. She was lean and hungry. I saw her go a bit faster and a bit further than the other girls. Allysha Bergado was ready this year. I knew that she was injured last year and she has previously displayed a real mastery of the Combi that is sometimes lacking in the other female riders. Betting money was on her. 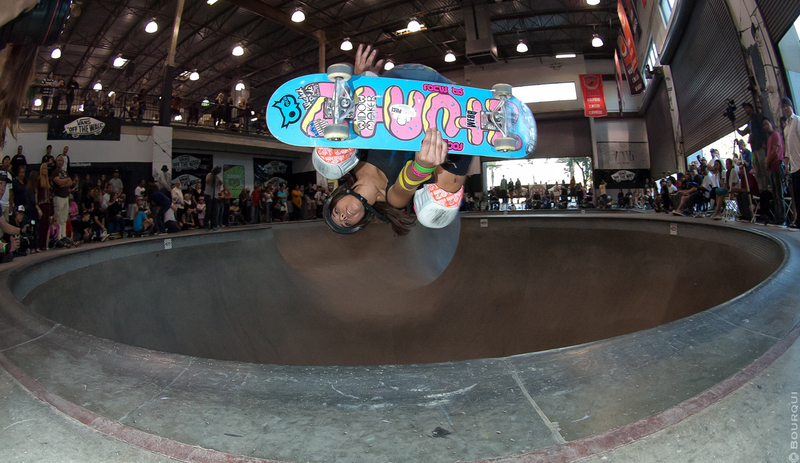 Nora Vasconcellos had lit the building on fire last year and everyone was eager to see her stylish lines in this contest. New pro Arianna Carmona was coming into this contest the top amateur winner… she had a bit of work ahead of her but appeared up to the challenge. Fast lines, big airs and corner boardslides were hers all day long. Alana Smith goes really high and has a fresh technicality that is awesome to witness. I watched her learn blunts in just a few tries the other night. She was a treat to watch. In the end, there was blood, dismay and victory. As all things go in life, sometimes stuff gets kicked sideways. Allysha Bergado bailed a Judo and was struck in the face with her board. Bloodied. Nora came out of the gate a bit off the mark. 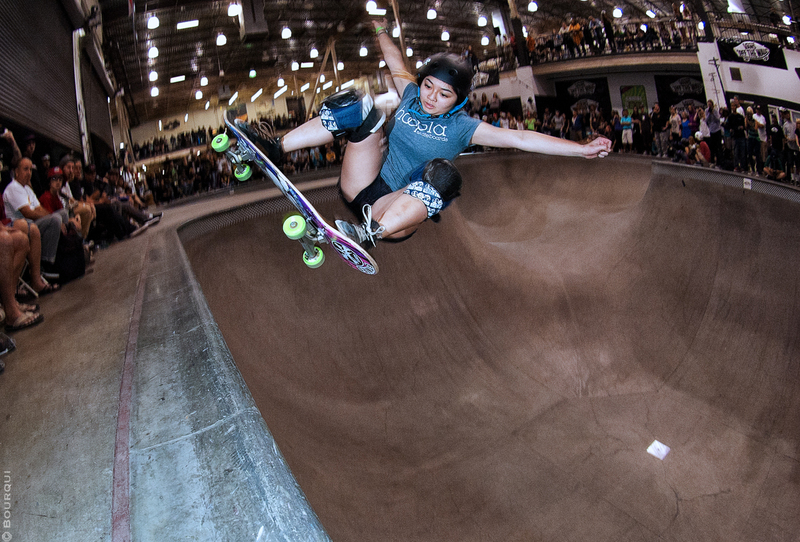 Big tricks and style were evident but falls kept her scores lower. Julz Lynn unleashed her fury on the pool. She went big and went fast. Arianna Carmona kept her cool and stayed consistent and clean. Strong runs were put down. Alana Smith pulled good airs and a blunt. She ripped a Hurricane as well. The judges tallied up the sheets and the end results were as follows: Julz Lynn in first place, Allysha Bergado in second place, Alana Smith in third place, Arianna Carmona in fourth place and Nora Vasconcellos in fifth place. Podium – 15 and over. I gotta go right along with Chris Eggers. This is an excellent contest article. hell yeah Nora and Brittney .wish i was there . This is the best contest report I have read since a long time. 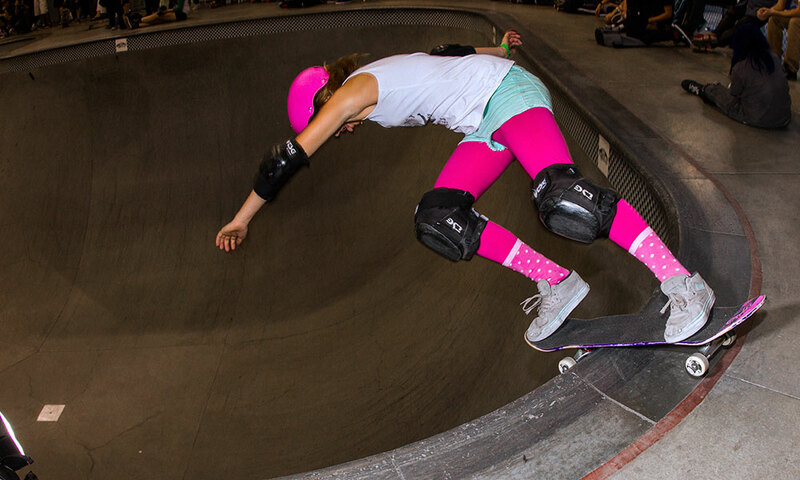 Women skateboarding is a great addition to skateboarding. This was needed. Thanks all the riders and Ozzie. Really good.